Light-hearted police left a “kind” note saying “Oops! Sorry we missed you” after digging up a cannabis plantation in woodlands. Officers discovered the haul of plants in woods and jokingly left a message for the criminals. 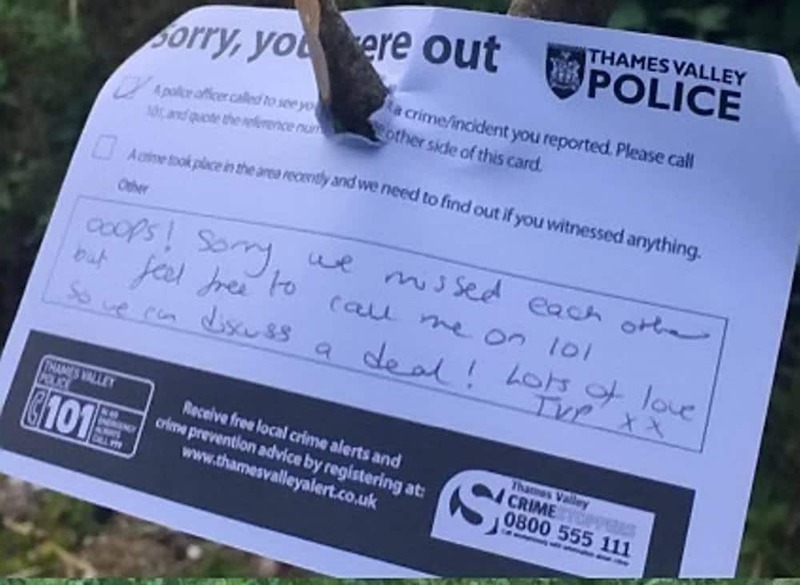 After unearthing the Class B narcotics near Oxford, Thames Valley Police left a “sorry you were out” note and offered to discuss a deal. The letter was signed off with “lots of love” from the force and finished with the hashtag “WeveGotManners”. The cheeky note said: “Ooops! Sorry we missed each other but feel free to call me on 101 so we can discuss a deal. The cannabis was found on Friday 6pm after a tip off from a member of the public about the drugs farm near Wolvercote Mill Stream near Oxford. Online commenters joked the police were littering the woodland by leaving the note. One said: “I think I’ve got a plant like that in my garden. It comes up in a hedge every summer and I cut it back as it ruins the look of the hedge. “Well I never, I shall think differently of the old bloke I bought the house off, now. Previous PostMissing cat found living on a beach returns home after a year!